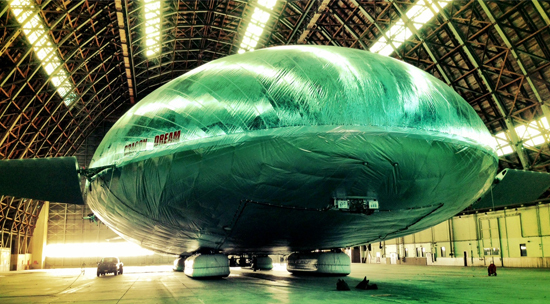 It's a bird, it's a plane, it's ... an experimental military stealth blimp! Airships don't exactly have the best history. Most often than not, whenever someone mentions blimps, we either think of a giant Goodyear airship floating around outside a sports stadium or the horrific Hindenburg disaster from way back in the late 1930s. And while airplanes are more or less the go-to way to travel around the world, a new Pentagon-backed project looks to bring airships back into style. Meet the Pelican, a 230 foot long prototype airship developed by Aeroscraft, and the first of what may be a new fleet of blimps designed to transport several tons of cargo across long distances using far less fuel than your typical airplane. Using a system that pumps helium from "lifting-gas cells" to pressurized tanks, the Pelican is capable of flying vertically and controlling its own buoyancy much easier than other types of airships, which usually require runways to get airborne and require extra ballast to stay grounded. The Pelican is still in the testing phase, and hasn't seen much travel outside of its California-based hangar. Provided future tests go well, Aeroscraft is hoping to build a much larger, 450 foot long airship capable of hauling over 60 tons of cargo. Along with ferrying supplies around, the Pentagon is already thinking of how it could be used for surveillance missions, albeit one has to wonder how inconspicuous a giant floating balloon might look overhead in a warzone.